Packed with lemongrass, galangal, kaffir lime leaves, chilli, basil and tamarind, this popular soup conjures up the flavours of South Asian cooking. Traditionally served with jasmine rice, it also suffices as a delicious meal on its own. Bring stock to the boil in a deep pot. Stir in fish sauce, tamarind paste, garlic, galangal, lemongrass, chillies and kaffir lime leaves. Reduce heat and simmer for about 30 minutes to flavour stock. Add prawns and simmer for 2-3 minutes until cooked. Season soup with sea salt to taste and stir in half the basil or coriander leaves. Ladle soup into bowls and garnish with remaining basil or coriander leaves. Tried this recipe but forgot to put fish sauce..oops!! i added straw mushroom to it. 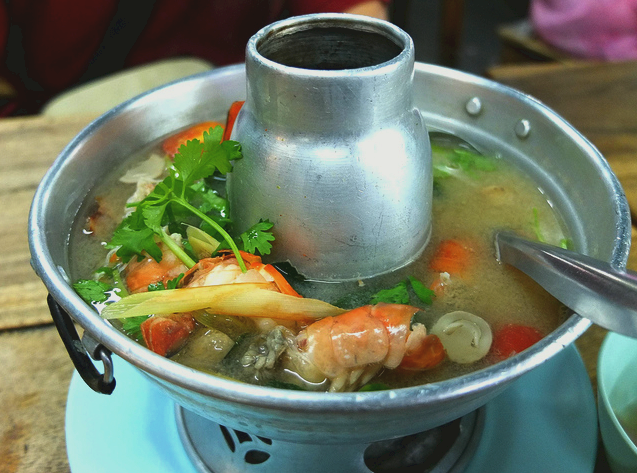 Tom yum soup wasn’t flavorful enough. Tks for this recipe though, will try again next time. You are wellcome. Fish sauce is a must! ?? This looks delicious. I like seafood soups and dishes.